DONETSK, September 2. /TASS/. The funeral procession in memory of Prime Minister of the self-proclaimed unrecognized Donetsk People’s Republic [DPR], Alexander Zakharchenko, who was killed in a terrorist explosion on Friday in Donetsk, has begun. 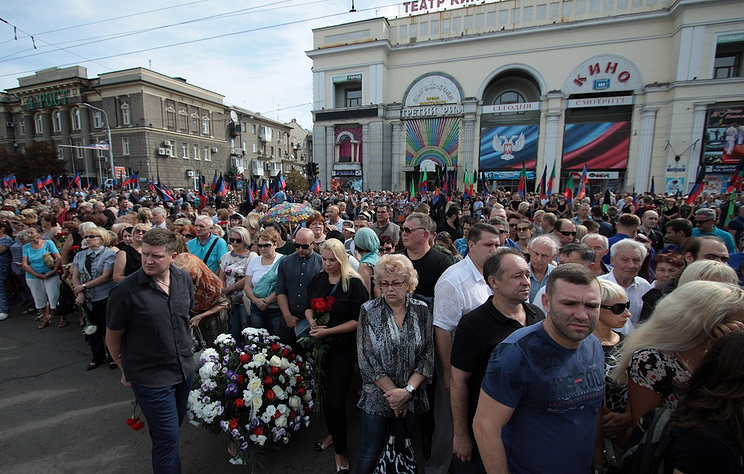 According to the Donetsk news agency, around 200,000 people are participating in the funeral march. Zakharchenko’s coffin was placed on a gun carriage of an artillery weapon, towed by a truck. The car will pass through Donetsk’s main street until the administration building. He will be buried at the Donetskoye more cemetery in Donetsk’s Leninsky District, along with Arsen Pavlov (codename Motorola) and Mikhail Tolstykh (codename Givi), who also died in terrorist attacks. Zakharchenko’s funeral ceremony took place in the Donetsk State Academic Opera and Ballet Theatre named after Solovyanenko, with tens of thousands of people attending. Delegations from the Russian Federation, the Lugansk People’s Republic, Abkhazia and South Ossetia came to Donetsk to pay their respects. Alexander Zakharchenko, who had been Prime Minister of the DPR since 2014, died in an explosion in downtown Donetsk on Friday. He was 42 years old. The blast left two people dead and nine injured, including DPR minister of taxes and duties, Alexander Timofeyev, and the head of a local youth organization, Nataliya Volkova. According to DPR Deputy Prime Minister Dmitry Trapeznikov, who was appointed acting head of the republic, law enforcement agencies have already detained several suspects in the blast, who confirmed the Kiev government’s involvement. Earlier, the Security Service of Ukraine (SBU) denied any role in the blast.